The Central University of Haryana Official released CUH Recruitment 2019 Notification. This time the Advertisement is for the 53 Teaching Positions available in the Organization. Through this post, we are going to share the complete details about the Eligibility, Important Date, Application Submission Process and all. Therefore, all those people, from Haryana State, who are looking for the Government Jobs, can use this chance. By 31st January 2019, all the interested candidates, have to submit the application form in the prescribed manner. Well, the Address to send the filled Offline Application Form is given in the coming sections. For all the people, from the Haryana State, who are looking for the Government Jobs and Completed their Graduation and Post Graduation from any Recognized Institute or University can head to check the remaining details in advance. Remember the officials of the Central University of Haryana are going to reject the applications that are not fulfilling all the Requirements that are mentioned in the official CUH Teaching Recruitment 2019 Notification. If you are not eligible, you can always check our site Freshers Now, for more data. And then if you are eligible, fill the application form, by downloading it. Total CUH Recruitment 2019 is shared in this post. If there are any people, who are searching for the Government Jobs in Haryana Share it with them. CUH Recruitment 2018-2019 Notification is grabbing the attention of the people who are looking for the Government Jobs. Apparently, there are total 43 Executive Engineer, Hindi Officer, Finance Officer, Laboratory Attendant, Internal Audit Officer, System Analyst, Senior Technical Assistant, Professional Assistant, Assistant Engineer, Personal Assistant, Security Inspector, Laboratory Assistant, Security Officer, Private Secretary, Library Assistant, Kitchen Attendant Vacancies. Check them all. And apply for the position that grabs the interest of you. Accordingly, the people who are willing to apply should notice that they need to have had all the qualifications correctly at the time of applying. If not such applications are invalid. Therefore, hereby we suggest the people, to keep this in mind and proceed to apply. Now, according to the information in the advertisement, the officials asked the willing candidates, to submit the application form by 25th March 2018. After that deadline, the officials will not accept applications. CUH Recruitment 2018-2019 Notification is surely a good news for all the unemployed people in the Haryana State. Therefore, those people who want to do the job in Haryana state can check this post and this recruitment. Here we are going to discuss all the requirements that the people need to have at the time of applying for CUH Recruitment 2018-2019. Check them all and then proceed to apply. Remember that you need to submit the application form in the prescribed manner only. Then the officials of the Central University of Haryana will consider your applications. If not the officials will not accept them. All the contenders should notice this. Apparently, to apply for this Non-Teaching Vacancies, all the people should have done their 10th Class / 12th Class/ M.E / M.Tech/ Master Degree or any other Masters in relevant subject from any recognized institute or University. Take a deep look at the above place table. And it has all the information that you are looking for the CUH Recruitment 2018-2019 Notification. So, after checking this table, if you check remaining information, you will have an idea. Therefore, it is better for the people, to check this table at first. And as mentioned earlier in this article, all the contenders should have the correct educational Qualification while applying. And remember that the requirement of education will change for each and every position. So, it would be ideal for the applicants, to refer the advertisement for the post-Wise Educational Qualification information. More other details related to this CUH Recruitment 2018-2019 Notification are discussed in the next sections of this post. check them all. Along with the Education, having correct Age limit is also mandatory. As per the information in the CUH Recruitment 2018-2019 Notification, all the applicants need to have the correct age irrespective of the post they are applying for. Remember that not having either of Education and age limit, will make your application invalid. Keep this in mind while applying. It is very important to have them both while applying. According to the data in the advertisement, all the people should have the age between 32 years and 57 years. Remember that the age out of that limitation means your application form is invalid. Also, in the CUH Recruitment 2018-2019 Notification, Central University of Haryana Officials mentions that there is age relaxation too. Therefore, those people who are tending to apply can even check it out for age relaxation information. Now, next important topics, that needs attention in the CUH Recruitment 2018-2019 Notification is application Fee. Remember that even if having all the qualifications correctly and not paying the application fee, then your application form is not taken into consideration. So, keep this in mind. And to complete your application submission process, you all need to pay the application fee. This has to be done by the closing date. So, the applicants from the General and OBC Category have to pay Rs.1000/-. And according to the CUH Recruitment 2018-2019 Notification, SC/ST people are exempted from paying the application Fee. Keep this in mind. And please try to refer the notification twice or the official portal before making the Payment. Only after paying the application fee by the closing date will make eligible to go for next rounds of CUH Recruitment Process. So, before deadline pay application fee. Now after submitting the application form by paying the application fee, all the people will have to start their preparation for the Recruitment Rounds. According to the information in the advertisement, the officials of the Central University of Haryana are going to choose best contenders by conducting some Selection Process. As per the data in the CUH Recruitment 2018-2019 Notification, Written Test and Skill Test along with the Personal Interview are the Recruitment Rounds. Therefore, try to prepare for them. And give your best in the examination. Those people who will do good in those rounds will get chance to be placed in the organization. According to the Official CUH Recruitment 2018-2019 Notification, the Central University of Haryana officials is going to pay some good salary for the selected people. Rs.5,200 to Rs.20,200 is the Pay scale for the selected contenders. This is surely a good pay in the industry. So, do not waste this opportunity. So, proceed further and apply as early as possible. First, go to the official site of Central University of Haryana at cuh.ac.in. Then look for CUH Recruitment 2018-2019 Notification. 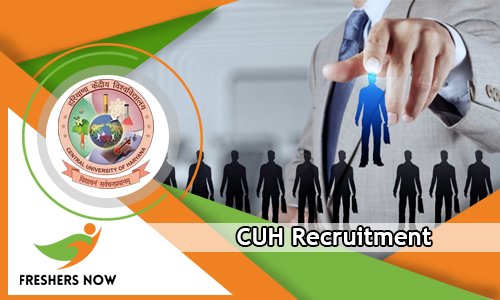 Freshersnow.com is a place where you will find Updates like CUH Recruitment 2018-2019. For more such Fresh Notification, visit us daily without a miss.